During our joys of jellymaking last fall, I found a really interesting recipe in the tips section of Mother Earth News Magazine (August 2009) where a reader submitted a recipe to make grape juice. Obviously it sparked my attention because I was planning a serious processing party for my grape vine. It sounded easy and straightforward and I am happy to admit it was. Thanks, Suzanne! All I did was set aside enough grapes to test the recipe for 2 quarts of juice concentrate. Well, if I must be honest we did 3 quarts but broke one of the mason jars in the canning bath but I won’t get into that adventure. All you need are 2 cups of grapes per quart jar and she suggests 1 cup of sugar (I did one jar with 1/2 cup and one jar with 3/4 cup of sugar: 1/2 cup is plenty!) and boiling water to fill the jar. We processed the jars for 10 minutes and Suzanne tells us in six weeks to strain out the liquid, dilute by half with water and enjoy. Six weeks after we canned the juice we entered the holiday season and I also entered my first trimester (forgetful? check. tired? check. inability to be productive in the kitchen? check) and the grape juice concentrate was sadly neglected on the counter behind my ignored kombucha. So I didn’t follow the directions completely but I’m happy to share that I opened the jars 7 months later (shhh! 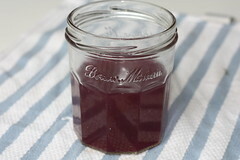 ), strained out the grapes and it tastes absolutely amazing! I diluted a quart of the juice for drinking and re-canned the remaining concentrate (sans grapes) so hopefully they will keep just as a juice. If it doesn’t, then at least I know that canning the whole thing and forgetting it was not a waste of time. This was way too easy to not plan to make massive quantities of juice next fall. I’m not the biggest juice fan but that’s usually because I don’t like all the sugar and high fructose corn syrup. 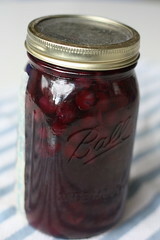 But this came from my garden and is better than any store grape juice I have ever drank! I can imagine it being lovely this summer over ice with a little seltzer water as I lounge in the sun in my hammock (if the sun decides to grace the northwest this year).